Starting with something borrowed... my friend Aimee, who opened my eyes to this creative life-line called beading so many years ago... has gotten back into her own creative jive again by making some incredible adjustable bracelets using macrame... and I love what she is doing (imagine!) So, here's my hand at that "borrowed" thing... following Aimee's lead and absolutely copying her idea with a teeeeeny tiny twist. I reached far back into my stash and found this beautiful ceramic bracelet connector from Bo Hulley Ceramics. It looks so awesome with the macrame. Love reaching back into my stash of special pieces to find the perfect one to showcase. Thank you Aimee, and Bo!!! Now to the "something old" part of this post... actually something my brain just opened up to -- Dream Catchers designed way back in the 19th Century, which I have always loved. 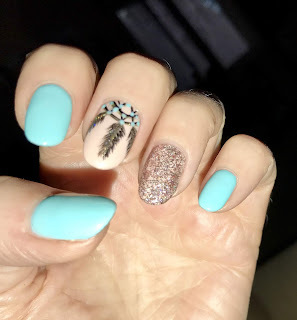 Heck, I have Dream Catchers on my nails right now! So, here's my first attempt, far from perfect, but a good start I think. It was a bit challenging for me using a small ring and 1.5 mm cord, but I do love the look, so lots of practice and more Dream Catcher variations will be in my future. And now, last but not least, the "something new". My latest brick stitched lovelies... I love doing brick stitch around a component. You can make it all up as you stitch. I added some loose wire wrapping at the top of the earring wires for some added design and hung some tiny little metal flowers in the middle. These are adorable in person.